Although we’ve made a name for ourselves as the Las Vegas steak restaurant that locals love to visit for happy hour and dinner, that’s not all we can do here at Off The Strip Bistro & Bar. In fact, one of our most popular meals of the day just happens to be brunch! When people in Las Vegas are looking for spectacular breakfast options complete with lovely handcrafted morning cocktails that are perfect for shaking off last night’s party fatigue. You know what’s perfect for fueling up your body after a long night of enjoying Las Vegas? A stack of our legendary pancakes. Available in both a short or tall stack, these pancakes aren’t made with pre-made, powdered batter like some brunch restaurants in Las Vegas. Instead, our chefs carefully blend up a batch of our house-made batter every morning, then pour it on a sizzling griddle when you order, so they’re always fresh and hot. 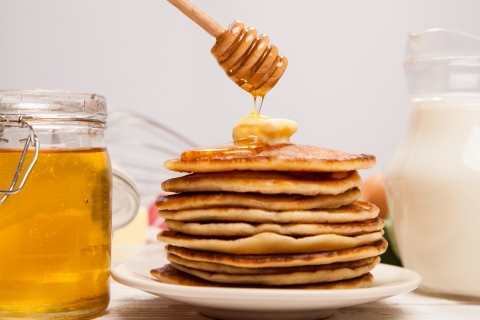 Served with creamy butter and perfectly sweet maple syrup, our pancakes are sure to hit the spot. And you know what pairs perfectly with a stack of our fluffy pancakes? Our delicious Bloody Maria morning cocktail, made with tequila, horseradish, Tabasco sauce and dijon mustard. Or if you’re in the mood for something a little less traditional, why not try our Beer-Mosa for your hair of the dog selection? No matter what day it is or what brunch food you’re in the mood for, Off The Strip Bistro & Bar is has high-quality options at affordable prices that will leave some money in your pocket for the slot machines.